The Rugged Ridge Receiver Hitch Extension is perfect for vehicles with an oversized rear mounted spare tire, or a beefy aftermarket rear bumper. 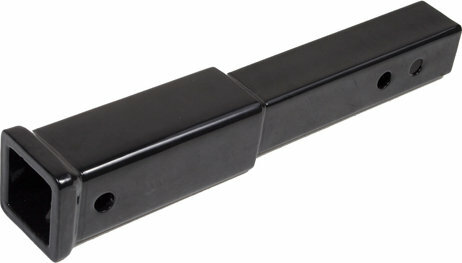 Constructed from solid steel the extender lengthens your receiver 2 receiver up to 12 inches! Simply slide it into you existing receiver, secure with a hitch pin, and you are ready to go! Includes two pin locations to adjust for optimum clearance. Great for mounting bike racks and other hitch carriers without hitting the spare tire. Do not exceed manufacturers tow ratings Maximum tongue weight of 175lbs.